How can you help the person receiving your email, who may be your next customer, to follow a link and find a page on your website? If the URL's on your website look like this http://www.mailroom.co.nz/Default.aspx?page=1597 - what a mouthful! Then you have what is commonly called a CMS or Content Management System. A CMS is great for updating your website but those links are awful - .aspx? - what is that! If you want to shorten a link you are sending out by email thus making life a little easier for your customer, try one of the websites that create short aliases from long URL's, like Tr.im - http://tr.im . 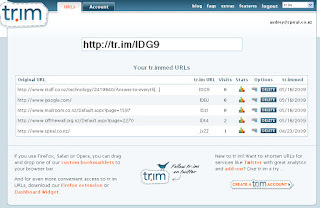 The Tr.im website generates a short URL for you, from a long URL that you enter into the website. For example the longish mailRoom URL above was tr.immed to http://tr.im/lDzl & tr.im/jxZZ will redirect you to the homepage of the Spiral website. PS. If you get bored you could try tinyURL-whacking - placing random letters and numbers after the forward slash in an attempt to hit interesting sites without knowing in advance what they will be.